Meanwhile, I am out sick (but hope to be back in fine form soon). The animals, however, have no tolerance for disruptions of any kind in their normal routine. Joe has temporarily taken over my morning farm chores, and they all keep telling him he's doing it wrong. The latest report is that Donkey Doodle Dandy is pushing for open access to the farmyard (where the hundreds of bales of hay are stored) so he and the sheep can simply eat "free choice" for the rest of the winter. Yes, I will definitely be back out and about soon. WCB #33: One Cat. . . Or Two? Hope you are enjoying your homecooked soups!! You were right, soup is easy when you have the greatest blogger in the world for inspiration! Thanks for all you do Susan!! Sorry to hear that you're not feeling well. Hope you're back to 100% soon. 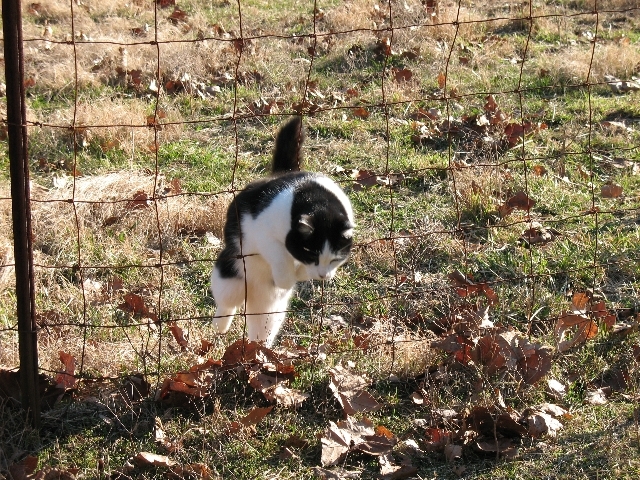 That is a cute picture of the cat going through the fence. They do tend to do as they want, don't they. Hope you're feeling better soon. I sure do enjoy your blog and all your photos. Love Patchy Cat....ad that is a great shot. Cats have no barriers, it seems! Mine is the source of endless interest and awe. They meditate, they rest, they play, they give and get lots of love....great life study! Sending you wishes for a quick return to full health after All DDD is waiting! Do hope you're feeling fit and in fine form to hop OVER fences soon. Animals just have that sixth sense to know when the time is right to get into mischief when no one's looking! I just made a batch of pecan chocolate chip cookies. So now I'm sending you a virtual buttery rich, buttery chocolate, buttery chip, buttery cookie. Again, I say it's crazy how much he looks like my Felix. And it looks like something Felix would be up to. I'm sorry to hear that you are sick and I hope that you are feeling better soon. Why is it that our children (human and furry) always try to pull one over on the Dad's when he is in charge?! They know better that to pull that kind of stuff with Moms. So sorry to hear you are not well - yes our animals also tell my husband and mother in law (who is 87 and lives with us) that they don't know how to properly feed or deal with their needs. HOWEVER - they survive and we all need for you to thrive! Take care and bless you, Joe for stepping up to the additional chores load! BTW - I was raised to believe hot chili burned out most illness - just a thought! Get better soon--it's no fun being sick any time, but especially hard when you have so many responsibilities as you. Love the picture of Farm Bos Patchy Cat. Hope you feel better soon, but doesn't it feel good to take a day off even though you are sick? Sometimes sick days are good days. I can knit, watch shows I taped and stored up, and drink lots of hot chocolate. Hope you're feeling better soon, FG! Helloooo, Farmgirl Susan! We hope you feel better soon. You know what you need? A white fluffy dog! Clinical studies have proven that white fluffy dogs cure what ails you. I read that on the internet. Really. Trust me. So, we are putting together a special little package for you! You'll love it! Please take care, and get well soon. Linda Sue forgot to tell you to throw a jalapeno into that chili. Yeek! Feel better already! Before DDD runs amok and the sheep eat so much hay that they can't squeeze back into the barn. I hope you have some oatmeal toasting bread rolling around that place to warm you up. Farmgirl, you've been out for a while...I hope all is o.k. and that your illness isn't too extreme. I'm hoping you're getting well! My word verification has "dr" at the end...hopefuly that's not some kind of eerie foreshadowing. Hey Farmgirl...I hope you are feeling better soon. Are all the animals giving Joe quizzical looks wondering where you are? What an absolutely charming picture. and I know how tricky it is to photograph a cat. Just when you are lined up to take the most incredible shot, they decide it is time for a nice munch and there you are with a 5" x 7" of their rear. O.K., Farmgirl...you've been gone almost as long now as you were when you were "taking a break" earlier this fall. I truly hope that you are o.k. Please feel better soon! I just found your blog and am enjoying it. I also had to share that your Boss Cat is the TWIN to our Chloe. Unfortunately the best picture I can find is http://mdessy.blogspot.com/2005/02/heeeeeres-chloe.html which doesn't really show the spots on her flank. But it was eerie seeing my cat on your blog! I'm sorry to hear that you are under the weather and hope that you are feeling better soon.